I love shopping but that doesn't mean that I have the right to waste money. So yes I am proud to say that when it comes to paying shipping charges I am stingy. I hate paying shipping charges almost equal to the cost of the product. Well in one such desperate quest of a website that ships International Cosmetics at less or no additional charges google has directed me to UrbanTouch. Honestly my quest hasn't fulfilled yet but I am glad I discovered UrbanTouch and I have shopped around 4-5 times so far. Read on to know about my experiences with UT. The Brands: It started with only few brands available in India but within a few months of time I am amazed to see more than 100 brands to be included. From local to global, dirt cheap to expensive and herbal to synthetic UrbanTouch has covered a considerable range of Brands. I said considerable because most of the high-end brands like 'Bourjois', 'MaxFactor', 'Mac' etc aren't available in UT. In a nutshell it's a E-Store of Herbal, Indian and Foreign drug store brands. Products Range: When it started there weren't any make-up brushes available. But today you see the variety of brushes available. This is just an example to say how UT is putting an effort in increasing the products range. I have seen many products added in Bath & Body section as well. 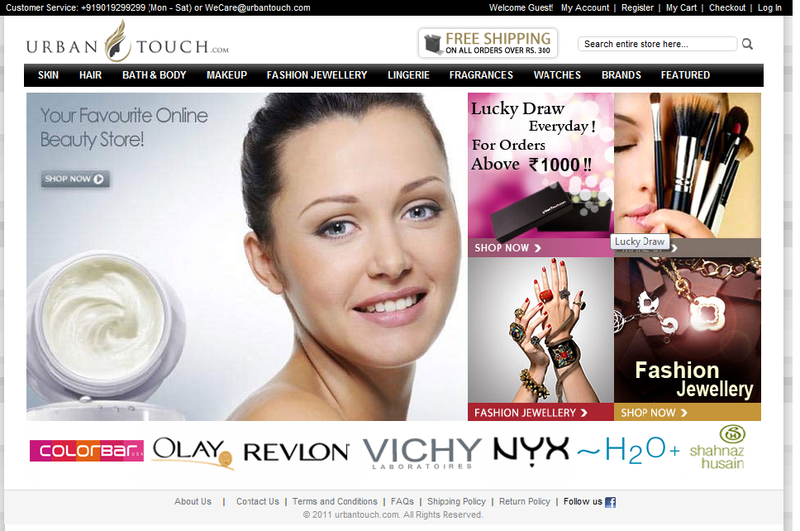 It recently started to sell Hair & Beauty Accessories. 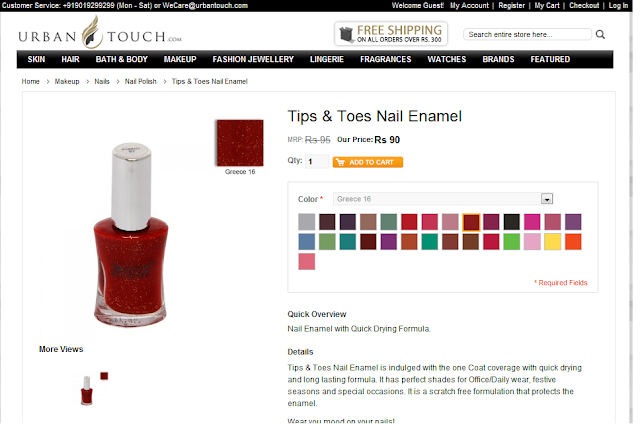 Shipping: It started with concept of free shipping and later changed to Free Shipping over 300 INR. Which I believe is a fair way to conduct business so no complains on that. User Interface: Very simple, neat and user friendly web site with clear categorization and descriptions. 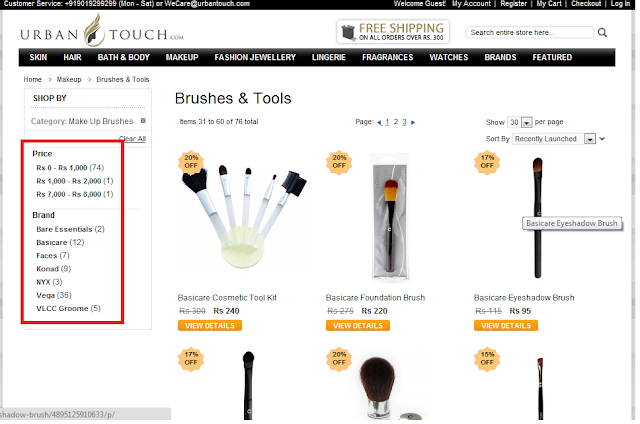 It initially used to show the same product in different shades separately but now it has grouped into a single product. Also I have purchased some nail enamels checking the shade provided in the display and they matched exactly. Payment Options: Net Banking, all major Credit Cards, Debit Cards and Cash-on-Delivery for selected cities. Package: Best feature of UT is the classy black boxes it uses for packing. They are sturdy and extra protection against breakage is provided through the thermocol stuffing inside. Customer Care: Just interacted once to let me know about a "Temporarily Out of Stock' tagged product as soon as it's available. I haven't even expected a reply but was surprised to get prompt reply when product was in stock. Surprise: Small gifts and samples would be sent depending on the worth of products purchased. So that's my experience with UrbanTouch :) I wanted to give a very brief review but ended up with such a detailed description owing to the fact that I enjoy shopping with UT. Dear Readers/ Fellow Bloggers: Please share your feedback about the review and your experience with Urban Touch through comments.